Schematic of the LRS, which uses a prism to disperse radiation through 5 slits onto a 2562 array. The LRS mounts to the 77 K optical bench opposite the wide-field imager. 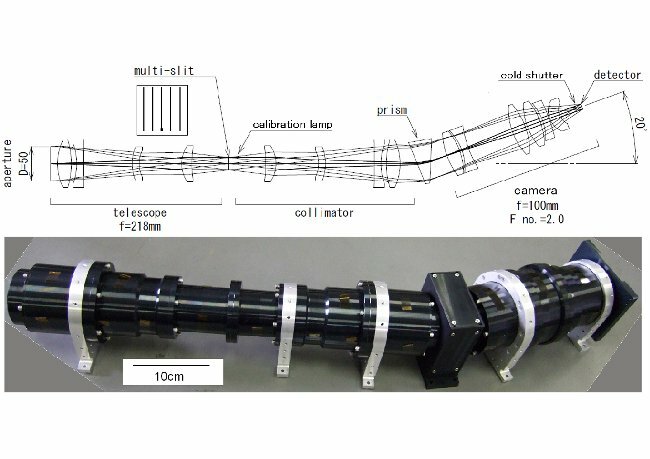 The low-resolution spectrometer (LRS) is designed to measure the absolute spectrum of the near-infrared background in the 0.8 - 2.0 μm spectral region, in a search for the redshifted Ly-cutoff feature, a signature of UV photon emission from when the universe was partially ionized. The IRB may peak at λ ~ 1-2 μm and fall in brightness in the optical. The transition from the near-infrared to the optical, if confirmed, would have a much different spectral shape than either zodiacal light or the integrated counts of galaxies, providing definitive evidence for a first-light galaxy IRB. The LRS is a 5 cm refracting telescope with re-imaging optics. A prism inserted in the collimated beam produces low resolution spectra (R = 13 - 25) for wavelength bands from 0.8. μm to 2.0 μm. We use a 256x256 HgCdTe array with a pixel size of 40 μm, producing 1.4' × ~1.4' pixels and total field of view of 5.8°. Four slits located at the field stop produce 2.8' × ~ 5.8° strips on the sky, which the prism disperses into separate spectra on the array. As a result, 256 spectra are available for each slit, and a total of 1280 spectra are obtained. The expected LRS sensitivity (summarized in at left) is sufficient to measure the spectra of the IRB excess and the IRB fluctuations reported by the IRTS. In order to obtain an accurate spectrum of the sky, after rejecting spectra that include point sources brighter than 18th mag, 900 individual spectra can be co-added. The resulting sensitivity with 400 spectra, shown by the dashed line in the figure below, allows us to detect the absolute sky brightness with S/N > 100 in only 15 s of integration time. In fields where more observation time is available we can probe the spectrum of the fluctuating component reported by IRTS. In a single pixel in 50 s, we can detect IRTS fluctuations with S/N ~ 5 as shown in Fig. 8. We anticipate having 1280 spatially independent pixels to this sensitivity. In order to subtract the Zodiacal foreground for a deeper search, we use the NBS line strength as an absolute tracer of Zodiacal emission. The Zodiacal color between the LRS and NBS is determined by the difference brightness of fields over a range of ecliptic latitudes. The data is also be directly compared with DIRBE, as have scheduled our observations so that all the fields fall within the range of solar elongation angles observed by DIRBE. The LRS will be absolutely calibrated in the lab with calibrated lamps and a beam-filling thermal source. The calibration will also be measured in flight with stars in our field, and may be compared to the lab calibration with an internal transfer lamp. LRS detection limits at 1σ significance (dashed lines) for a single pixel, and for co-adding 400 spatial pixels. The IRTS and HST extragalactic background are shown as red and green data points, respectively. The rms fluctuations reported by the IRTS are shown as blue data points. The zodiacal light spectrum at the ecliptic pole is shown for reference.